SKIATOOK, Okla. – At the corner of Chief Mad Buffalo and Red Oak streets, in the Osage Nation’s new subdivision Sky Lodge Estates, Osage families gathered excitedly to receive the keys to their brand-new homes. 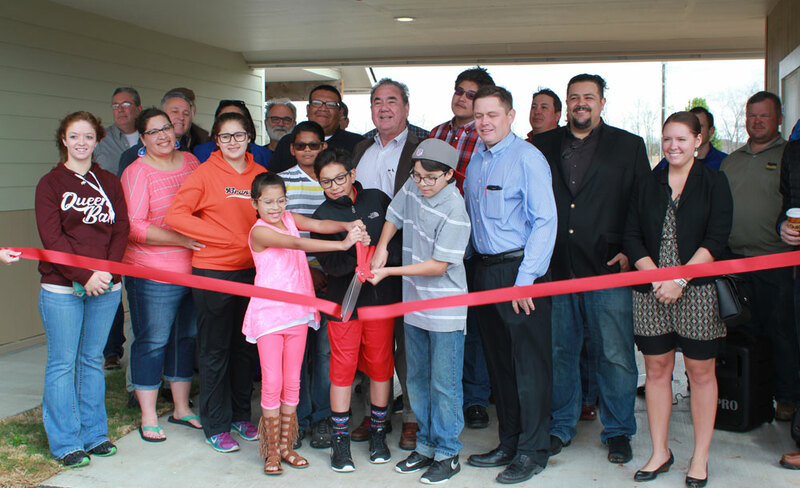 Families moving into Sky Lodge Estates cut the ribbon to officially open the property for move in on March 29. The Nation broke ground on the 15-home subdivision in February 2016. The rental and rent-to-own subdivision is located off Lenapah Avenue south of State Highway 20. The 15 homes are a mix of three- and four-bedroom housing units and were constructed with federal NAHASDA grant money awarded to the Nation. First-time homeowners, James and Ashley Cosby, said they were ecstatic when they found out they had been chosen to own a new four-bedroom home. They have three children, two boys and a girl. Standing Bear pointed to open areas of grassland on the property and said they are planning more homes for the area. He said the location of Skiatook, which is roughly 15 minutes from downtown Tulsa, is a good location for those Osages who work in Tulsa and who still maintain ties with their Osage history and culture. The Native American-owned architectural design firm Blue Star Studio Inc. developed the housing plans, which have been described as affordable, energy-efficient, handicap-accessible and equipped with covered carports and storm shelters. Osage interior designer Chad Renfro designed the interior of the homes and Jenks-based, Native American-owned Maska Builders oversaw construction. Ashley Cosby said they applied for a home two years ago with the Nation and when Sky Lodge Estates became a reality they applied for one of the homes and kept updating their application in hopes of getting a home. They received word about two weeks ago they had received a home. “We’ll probably move in this weekend. We’re really excited!” she said. Marilyn Booth, first-time homeowner, received the keys to her new three-bedroom home she will live in with her son Athen and held back tears. “I want to thank you guys for everything, everything’s beautiful, we’re excited to get our house and thank you for the opportunity and we’re very appreciative,” she said.